Irroke the Wide is a Nord barbarian residing in the small town of Pell's Gate. Umbra used to be his apprentice and asking him about her will reveal her location during the related quest. He leads a simple life, eating dinner in his house from 8pm to 10pm and sleeping in the same place from 10pm to 4am. 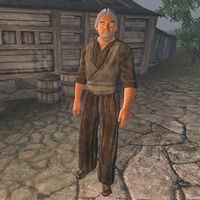 Outside those times he will wander around Pell's Gate, at times conversing with his fellow townsfolk. He wears a lower-class outfit consisting of a coarse linen shirt, coarse linens, and a pair of oiled linen shoes. His only other possession is leveled gold (typical of lower class citizens). The Daedric Prince Clavicus Vile will send you to Pell's Gate to search for information on what happened to Umbra. Irroke the Wide turns out to be the most knowledgeable as all the other citizens will say: "Umbra? You need to speak with Irroki the Wide [sic]. I've got nothing to say about Umbra." Asking Irroke the Wide about Umbra when you are not on good terms will have him deny your request for information: "Aye. I know of Umbra. But you're a stranger to me, and I'm not talking." If your disposition with him is greater than or equal to 60 he will tell you what he knows about Umbra; "Umbra. That's a name I haven't heard in a while. And it's not one you should be using around Pell's Gate, either. Before I go on, let's clear something up. Are you here asking about the sword or the person. Which is it?" Regardless of your choice you will be told the same information, just in a different order. If you ask about the sword first he will reply; "It's a powerful sword, no doubt about that. Jet black. Got a wicked edge on it, and they say it can steal a man's soul. I know of at least one soul it stole. Lenwin. She's the one who found the blasted thing. I suppose you want to hear about the person now." You will then ask to know about the person, Lenwin, who now goes by the name "Umbra". Irroke will then explain what happened to Lenwin; "Who is Umbra? I can tell you who Umbra used to be. Lenwin. She's my apprentice. Or at least she was, until she found that sword. Never did say where it came from. She just showed up with it one day. Said it was called Umbra. But she was different. She'd always been fair with a sword, but she began looking for fights. Became bloodthirsty. Then started calling herself Umbra, after the sword. Finally signed on with some mercenaries, but I hear that ended, too. We haven't seen her in years." When asked about her current location, Irroke will sadly say: "Can't say for sure. Some say they've seen her nearby, near the Vindasel Ruins. Might just be wishful thinking, though. If she's around, she hasn't come into Pell's Gate. Nor should she. I fear that girl is long gone.If you seek her out, take care. She's a powerful one. Or at least that sword is. I'd steer clear if I was you." Asking him about Umbra again will have him claim that is all he knows; "I can't tell you any more than I already have. I'm sorry." When he exits conversation he will add: "I wish you luck. I fear you'll need it."